I had the pleasure of teaching two classes at Paper Tales in San Diego this past weekend. My niece Courtney came with me so I would not have to make the drive alone (I do love the carpool lane when driving through LA and Orange Co). 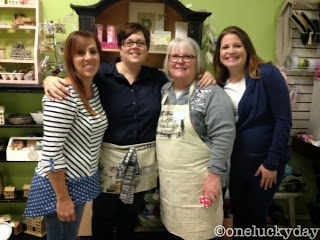 We arrived early Friday evening to meet up with Michelle, the owner of Paper Tales (and her fab-u-lous daughter Kailie). We got everything set up for the first class of the day. That makes for much less pressure the morning of the class! Thank you Courtney for coming to help! Once we were set up, I took a little tour around the store. 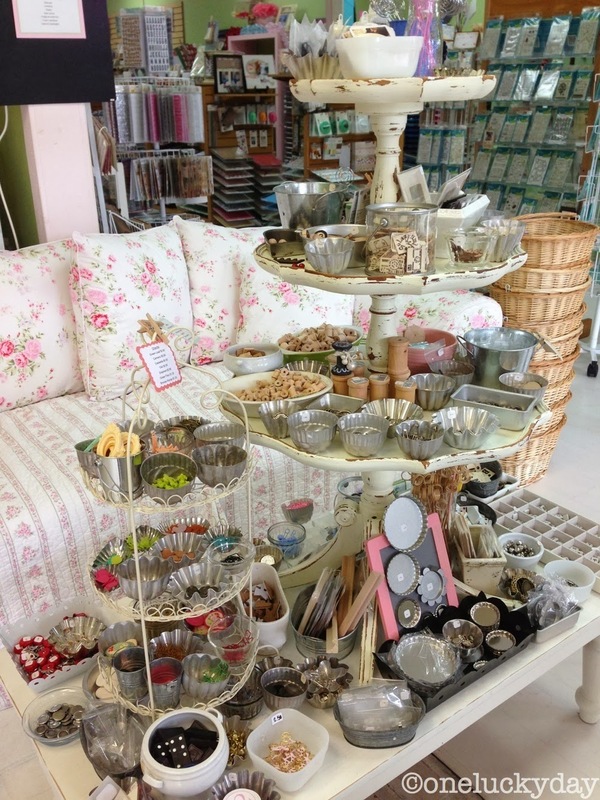 Love the couch and all the little trinkets in the tart tins and bowls! Why didn't I buy more little bags? darn it. Oh, I should have come earlier. 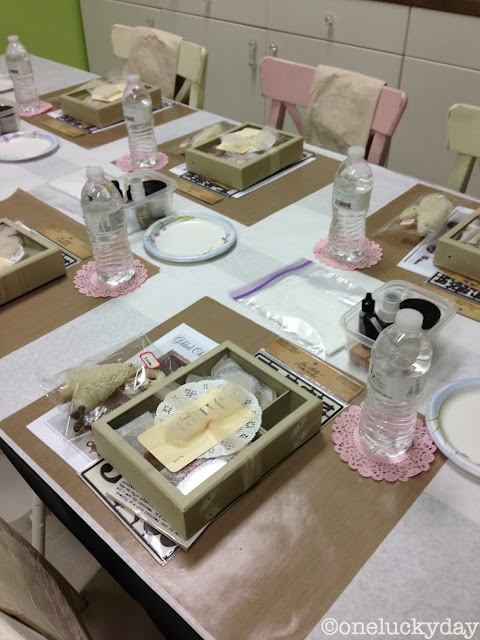 And now to get the class started! 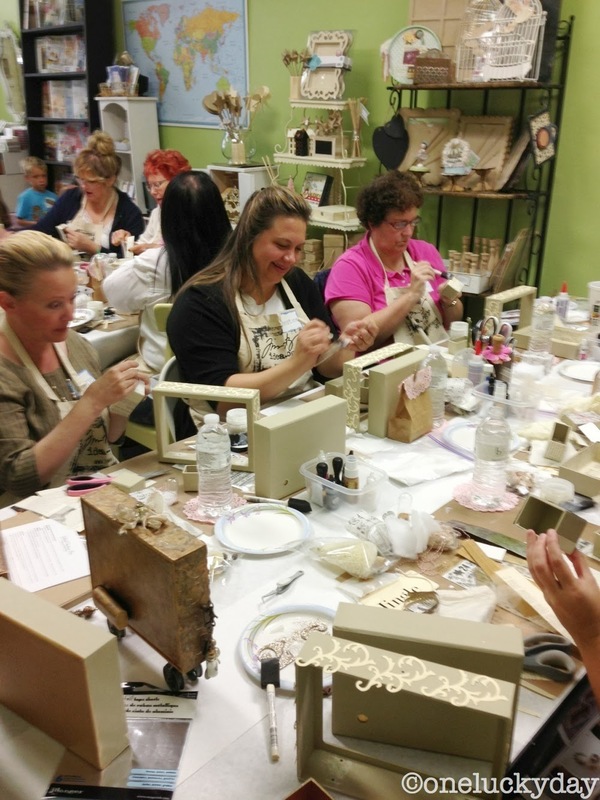 Here they are adding vintage paper to the Configurations boxes. Almost done! The pulley wheels are ready to go on! The effervescent Leslie! So nice to have her in class! She's all done and right on time! What a great class. Just a couple more shots from the day. Jo and Dotti came to the afternoon class. I seriously thought I was going to bust a gut over their banter. Funny, funny ladies that had everyone laughing. Michelle the owner of Paper Tales (on the right) and my niece Courtney (on the left). I think I could live right next door to Michelle and be perfectly happy. Such a nice lady and easy to talk to. 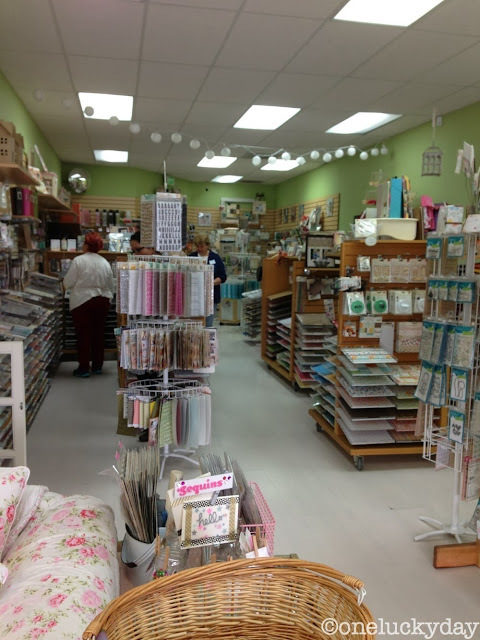 She has really put together a great store for crafters, scrapbookers, and anyone who just likes a bit of girl stuff. What a fun place to be. And these two very special girls showed up to my afternoon class. 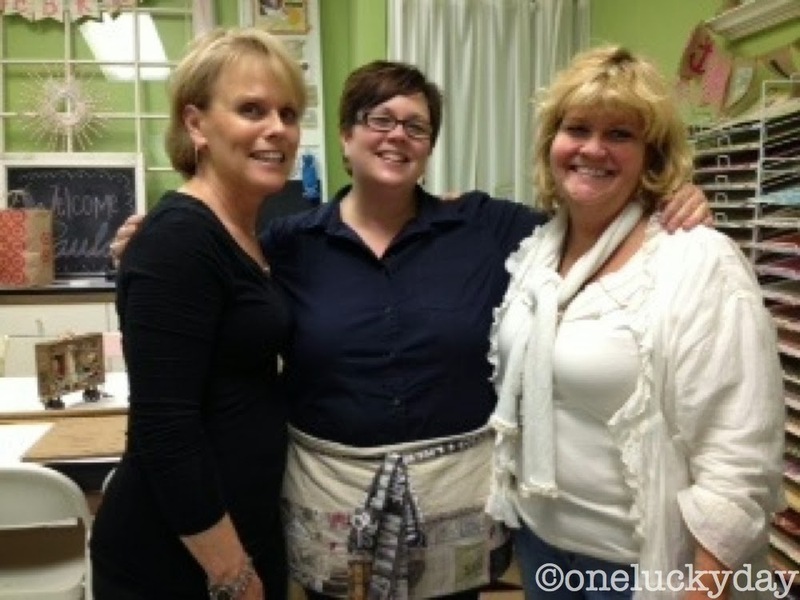 My friend Sue came from out of state to visit her daughter Annie and they both signed up to take the class. What a surprise! She even brought me a bundle of yardsticks to replace the ones I lost in TX. I have known Sue since I was silly teenager. We have been to Round Top together, cried at my parents funerals together and celebrated her kids getting married together. Thank you Sue for traveling so far to be in class. Annie is just a couple months from delivering a baby boy so I am sure she will be back in the San Diego area soon! Courtney and I were so glad to see you both. 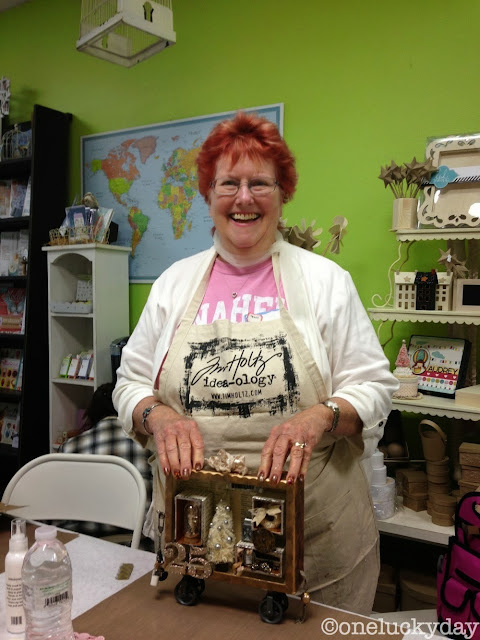 I have one more teaching weekend for 2013 - Whim So Doodle in St Petersburg, FL on December 6-7th. 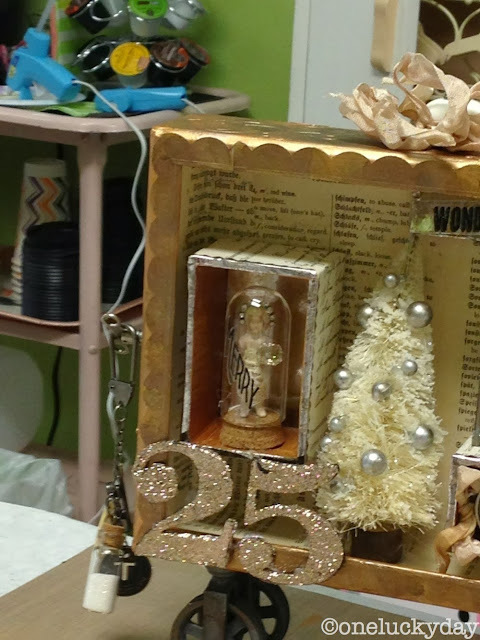 I am teaching 3 classes including the Gilded Christmas Box. Please contact the store for more information and sign-ups! Ohhhh wow this is gorgeous you all make. And a lovely Post. 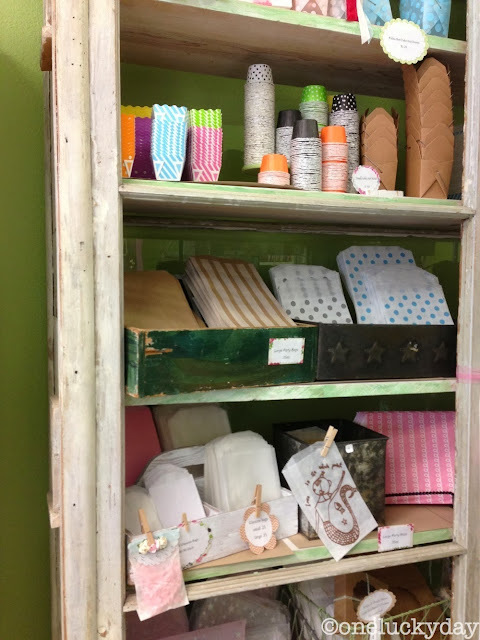 What a beautiful little store! Love the store, wish I were near. The colors are refreshing and calming at the same time. 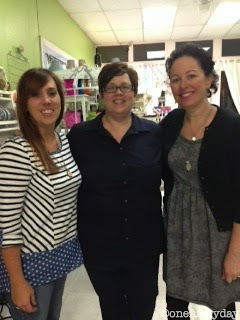 Thanks for your work to let us peek into the store and class. 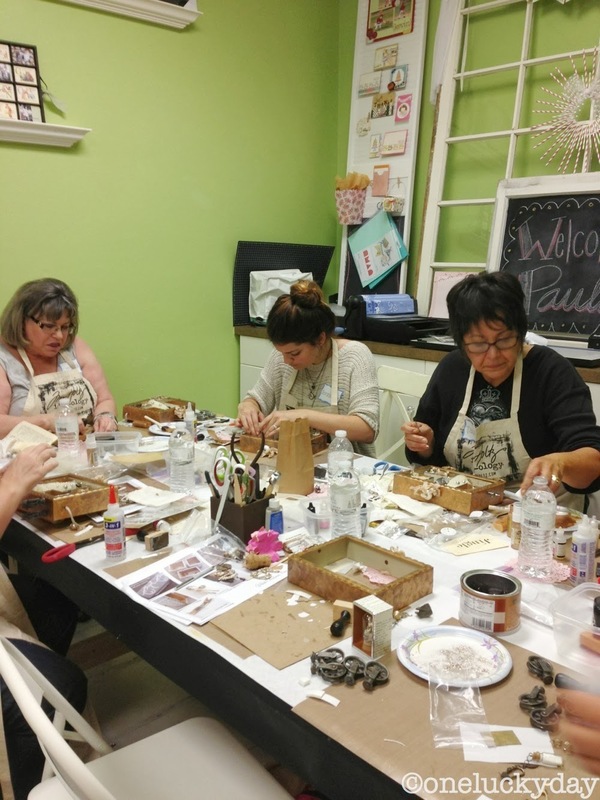 LOVE this project Paula but I was teaching a class that day...I recognize a few of my students in your class! Jo and Dottie are a hoot! Well darn it Denny, I wish you would have been there too! I am sure I will be back in 2014 so next time around! Oh Denny - you sooooo need to check out Paper Tales! I love this store. It's so cute and darling and feels almost like I'm shopping in my own living room. My friend, Norma and I can easily spend a couple of hours in this store, and it's not that big. So fun to take your class and visit with you and Courtney! 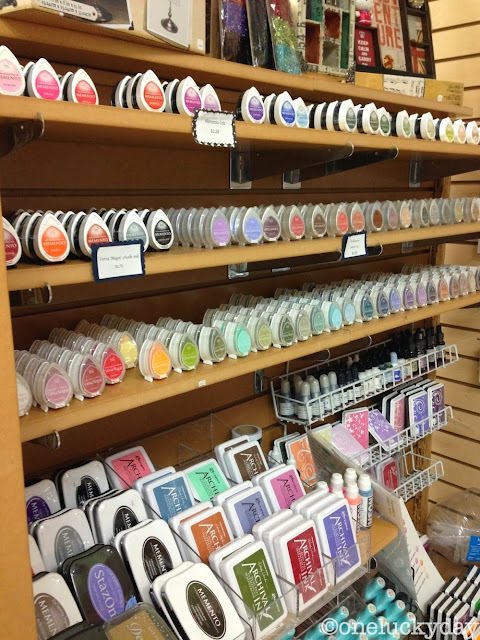 And now I know what to do with alcohol ink! 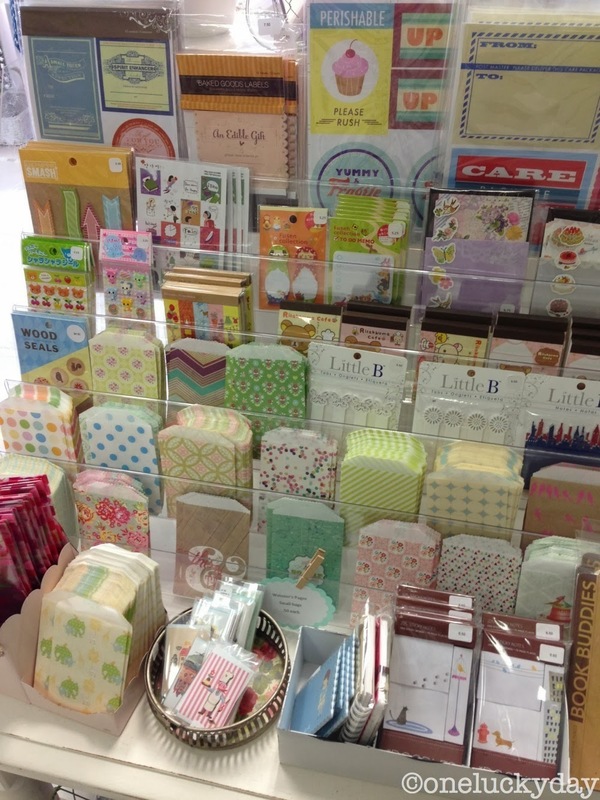 Super cute shop too. Our little projects will be heirlooms one day I think. Annie and I enjoyed every minute. Had such a fun time Sue - so glad to see you guys! wonderful project! Looks like a great time and a fabulous store! Looks like a fabulous store... so many happy students and I'm sure a wonderful weekend for all! 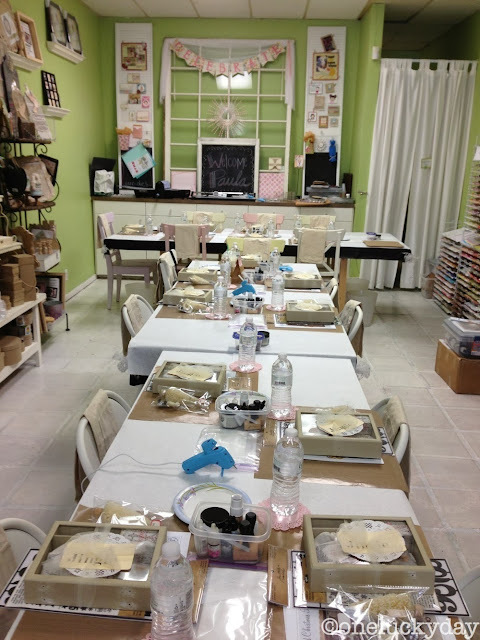 Oh I am just sick that i couldn't come to the class.The shop is darling and looks like so much fun. But I am enjoying working on my kit at home, but like a turtle. Thanks Paula for this project. 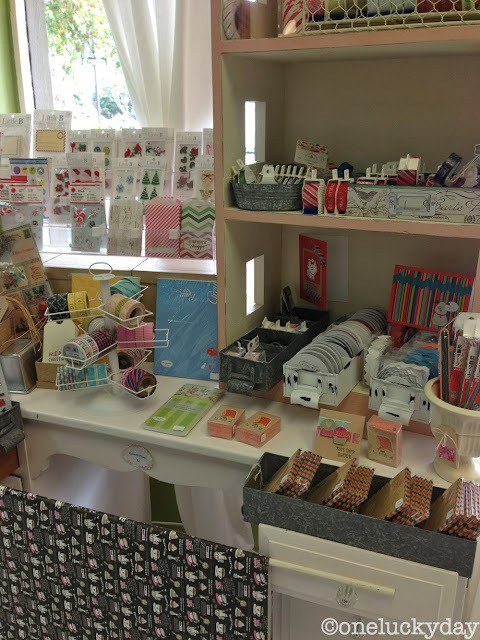 Next time I am in that area i am going to stop at Paper Tales and get some little bags and will send some to you if you still want more. I thought about you Judy when I drove past your town! I am going to vacation there some day! That would be so nice, especially when the Flower Fields are in bloom. Sending you a picture. Looks like loads of fun. Hoping for my own pink doily at the Doodle next month! I hope to visit that gorgeous store someday!!! I love the class you did...wish I could have gone! Michelle is a delight!!!! Love that your friend came too...so special! And, you look absolutely wonderful!!! 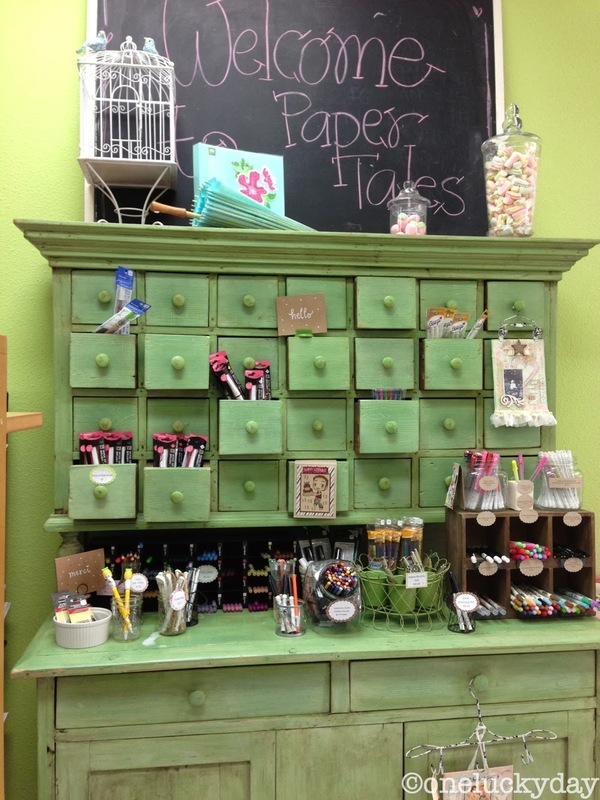 This store looks amazing!!! I so enjoyed this post. I have never seen such a collection of such goodies. The tarts on board down to class area. Owner should be very happy that she has such a wonderful place for customers to enjoy. Love love this post. For all of you planning to visit this store some day - you absolutely MUST! I love the way Michelle's displays are beautiful and it's an adventure shopping at Paper Tales. Every where you turn, there is something adorable to find. 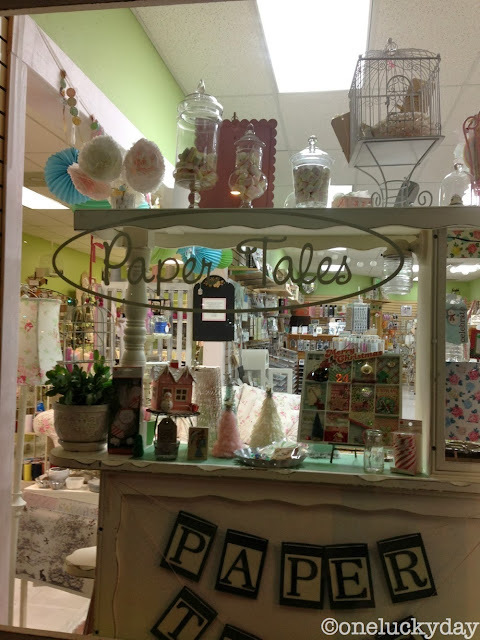 So if you only come to San Diego to shop at Paper Tales - do it!!! It is soooooooooooo worth it!